“An amazing archaeological discovery.” This is how Prime Minister Netanyahu called the recent discovery of a 3,000-year-old beka stone used for weighing a half-shekel worth of silver. The little weight stone was found during on-going excavations at the foundation of the Western Wall. Obviously, Netanyahu is using this finding as an opportunity to debunk the false Palestinian narrative that traces their origin not to the Arabian Peninsula, but to one of the nations of ancient Canaan, like the Philistines and the Hittites. Archeological findings proving the obvious–that the so-called “Palestinians” have no history in the Land of Israel–continue producing an abundance of material validating both biblical and extra-biblical sources that tell the story of the people of Israel in the Land of Israel. 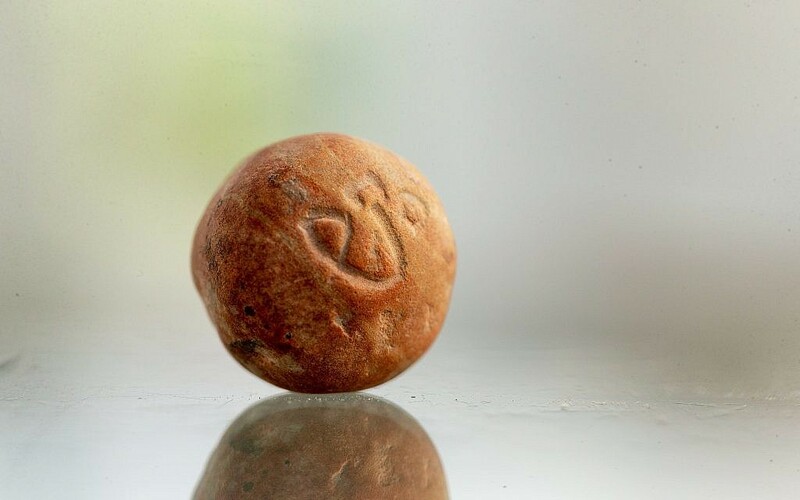 The tiny stone inscribed with the inverted Hebrew “beka,” is one only a handful of First Temple-period weight-measuring stones ever found, and the only one found with its inscription intact. It was found thanks to the Emek Tzurim Sifting Project. This volunteer-based project recovers archeological artifacts from 400 truckloads of topsoil removed during the 1996-1999 construction of the huge new underground el-Marwani Mosque built in the space known as Solomon’s Stables. This illegal digging by the Muslim Waqf, which Israel did nothing to stop, was supposed to erase any Jewish connection to the Temple Mount. The sifting project itself, began in 2004 as a private initiative of Israeli archaeologists Gabriel Barkay and Zachi Dvira, has yielded hundreds of artifacts, including coins, jewelry and fragments of the Second Temple floor tiling. Since 2017, the project has been funded by the Israel Archaeology Foundation. The beka weight is dated to the time of Solomon’s Temple that stood in Jerusalem from the 10th to the 6th century BC. The beka, or half-shekel (Exodus 38:26), weighing 11.33 grams (0.4 ounces of silver, $4.5 in today’s value), was an annual “ransom money” every Israelite man from 20-years-old was commanded to give for the Temple service: “each one must pay the Lord a ransom for his life” (Exodus 30:12). During the Second Temple era, the only “legal” half-shekel was a silver coin minted in Tyre. Jews living in Israel paid the half-shekel in their respective towns and villages. Jews from around the world who came to Jerusalem–particularly during the feasts of Passover, Pentecost and Tabernacles–paid this tax upon arrival to the city. These “tourists,” who didn’t always know the exact exchange rates, were easy prey for crooked money changers. Jesus, who himself paid this annual tax (Matthew 17:25), rightly condemned this apparently widespread practice of overcharging, a problem not properly addressed by the Temple authorities.